Montague Island has some of the best snorkelling and dive sites on the Eastern Coast due to its abundance of marine life, including the largest seal colony in NSW, sea turtles, dolphins, and array of different types of fish. Get up close and personal with the playful seals and see a vast range of marine mammal in their natural environment. 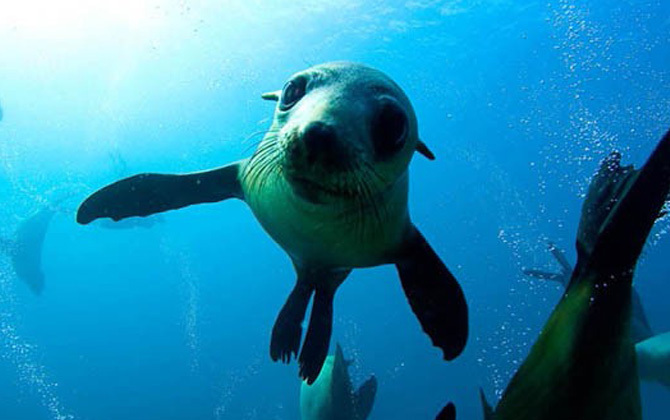 Narooma Tours provideds everything you need for snorkelling with the seals at Montague Island, including wetsuit, fins, mask & snorkel. Its the perfect addition to a Montague Island Tour! Enjoy a 20 minute boat ride to Montague Island, keeping an eye out for dolphin, whales, Penguins, and other wildlife along the way, cruise along the forshore, visit the seal colony, then anchoring up in one of the calm sheltered bays, snorkel with the playful seals and abundant fish life. Return to the boat for a cold drink and refreshment and enjoy your journey home.